ANJALI PUROHIT is a writer and an artist who paints pictures often with words on paper and at other times with oils on canvas. She writes poetry and fiction. Her work, quiet and ruminative, is about life, human character, circumstance and relationships that often pass beyond the well defined into intangible realms. Much of her work (both in her writing and her art) is obsessed with a longstanding but fatal love affair she has had with her city that often breaks her heart. She explores an aesthetic that interprets personal experience in its social context and presents a perspective that suggest such a construction. 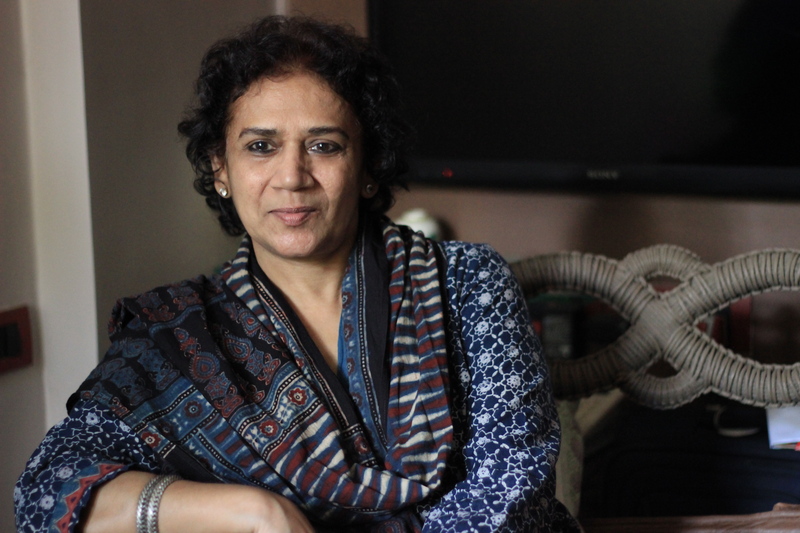 Her writing has featured in several anthologies and literary journals including International Gallerie, Coldnoon, Anthology of Contemporary Indian Poetry II, Four Quarters Magazine, Indian Cultural Forum: Guftugu, The Bombay Review, Antiserious, Queen Mob’s Teahouse, Desilit, Chowk, Teksto, Indian Writing from Around the World, Urban Voice India and Suvarnarekha. Her story, ‘Bitter Harvest’, was a winner in the Highly Commended Stories category in the Commonwealth Short Story Competition 2008-09. Her book, Ragi-Ragini: Chronicles from Aji’s Kitchen published early 2012 by Yoda Press, attempts to blur the distinctions between novella, food writing, poetry and illustration and, through this, to present a glimpse into Maharashtra’s culture that goes beyond Bollywood, Mumbai masala, advertising, commerce and competitiveness to emphasize a more inclusive, simple, less chauvinistic face of the people of this state. Her second book, Go Talk to the River: the Ovis of Bahinabai Choudhary, (Yoda Press, New Delhi, January 2019) is her book of translations of the Marathi (Ahirani) verses of the 19th Century peasant poet Bahinabai Choudhary. Anjali also curates cultural interventions that bring together different arts on a single platform to speak in conversation on a theme with the belief that when this happens the resulting creation is somewhat greater than the sum of its parts. Towards this effort she has been a part of – the Guggenheim Lab Mumbai in January 2013, curated an interdisciplinary event called ‘Holding up Half the Sky’ on the lives of women during the 100Thousand Poets for Change in Sept 2013, organized Mumbai Moulting: Erasures and a Palimpsest, a ‘Conversation’ between Art, Poetry and Music at the Godrej India Culture Lab, December 2013 and curated Vasundhara: Dialects in Dialogue, a dialogue between, Poetry, Art, Music and Dance at two shows in Mumbai in January 2015. Anjali has also curated the literature section of the Kala Ghoda Arts Festival2018. Anjali is the founder of The Cappuccino Adda, an initiative aimed at promoting a literary cafe culture in Mumbai. Anjali writer a fortnightly column in the Afternoon Despatch & Courier called The Art Column. She holds a PhD in Philosophy. Anjali lives in Mumbai with son, spouse, an equanimous disposition and fond memories of Misty, her dog.